Trading the head and shoulders chart pattern can be very profitable if you know how to trade it properly. In this addition to my free price action trading course, I’m going to show you a few profitable ways to trade the head and shoulders chart pattern, including the technique that I prefer to use. The head and shoulders signal is the first long-term price action pattern that I have gone over in this free course. There are several ways to trade this, some more aggressive than others, and it’s good to know how different types of traders are likely to approach this chart pattern, regardless of the technique that you choose to use. Note: There are bound to be other ways to trade this chart pattern, but when it comes to understanding how the majority of the retail market will trade this pattern, there are really only two classic techniques that you need to know. The head and shoulders chart pattern is a strong bearish price action pattern that occurs when the market makes the first lower high during an uptrend. The name comes from it’s resemblance to a head and shoulders, with the right shoulder being the first lower high of the uptrend. The neckline is typically drawn off of the candle bodies of the lows after the left shoulder and before the right shoulder. In the image above, the neckline is perfectly horizontal, which is not a requirement. 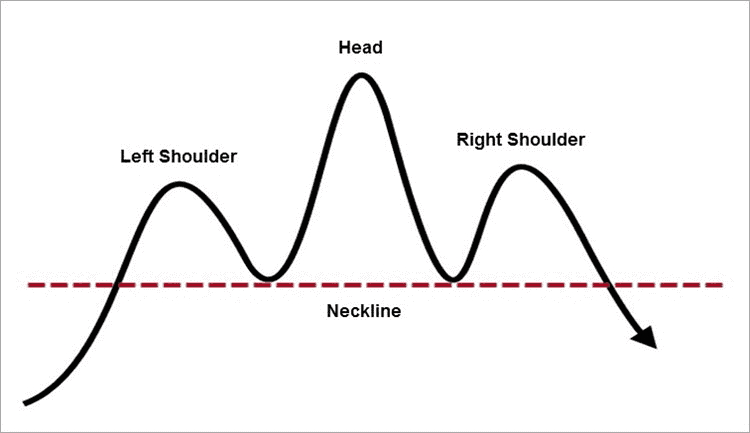 When the neckline is angled upward, the head and shoulders chart pattern is considered, by some, to be less bearish. When it’s angled downward, this pattern is considered, by some, to be more bearish. Note: I haven’t personally found the angle of the neckline to be a good indicator of the strength of this pattern. Instead, whether or not the uptrend has been an extended one seems to be a better indicator of strength in my experience. 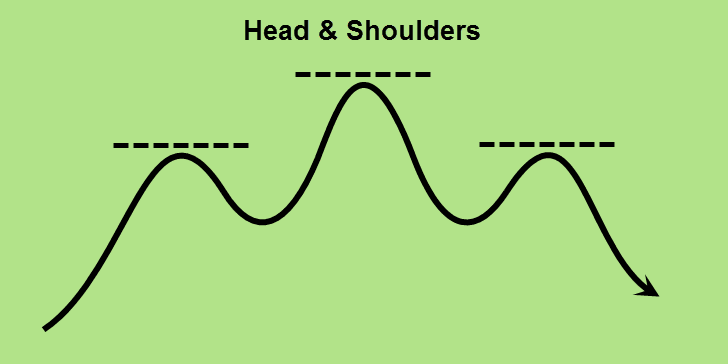 Beginning with the standard way of trading the head and shoulders chart pattern, the entry is taken when the neckline is broken. Some traders wait for a candlestick to fully close below the neckline before entering the trade. Others jump in as the neckline is broken, making sure to get into the trade before it takes off to the downside. 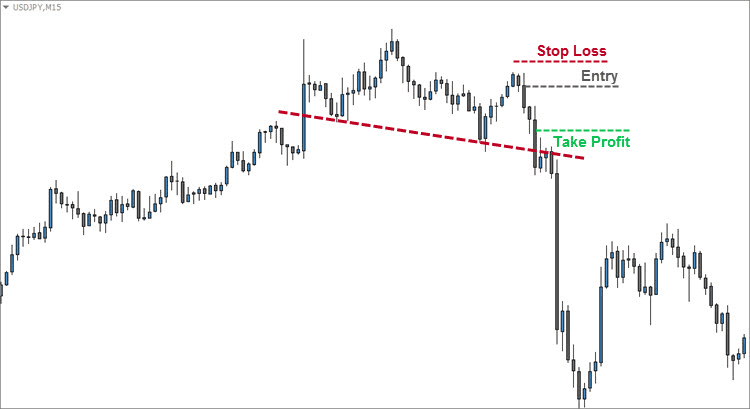 Your stop loss should be placed above the right shoulder of the pattern. To get your take profit, you measure, centered between the lows that form the neckline, to the highest high in the head of the pattern. Then take that same measurement, from the same starting point, and duplicate it to the downside to determine your take profit (see the image above). The next traditional entry, which I’m calling the “pullback entry,” is similar to the standard entry. Often when price breaks the neckline of the head and shoulders chart pattern, it will pull back to test the neckline as resistance. When this happens, it can provide a good, slightly more conservative, entry point. The entry trigger in the “pullback entry” could be a number of things. Traders sometimes combine this particular chart pattern with the signals from another trading system. It could also be a candlestick signal, or simply a candlestick that bounces off of the neckline (like the entry below). Note: A more conservative approach would be to wait for the candlestick to close below the neckline after touching it. Like the standard head and shoulders chart pattern, your stop loss in the “pullback entry” would be placed above the right shoulder of the pattern. Your take profit would be determined the same way as the standard setup as well. Measure from the center of the neckline to the top of the head. Duplicate that measurement to the downside for your take profit. Finally, I like to trade the head and shoulders chart pattern using a more aggressive approach. If I haven’t already entered at the top of the trend by trading MACD divergence, I try to anticipate the top of a right shoulder forming using either a shooting star candlestick pattern or a bearish engulfing candlestick pattern. In the image above, the entry trigger was a dark cloud cover candlestick pattern. I wouldn’t normally use this moderate candlestick signal on its own, but I would take it in combination with other bearish indicators, such as bearish hidden divergence. After drawing the neckline, I would determine whether or not to take my aggressive entry. I prefer to be able to, at least, move my stop loss to break even before the neckline is tested again. If I can’t do that, I will not take the aggressive entry, because price could find support at the neckline. Note: The trade pictured above would have reached a full take profit before re-testing the neckline. This is ideal, although they don’t all setup this way. My stop loss, in the example above, is 5 pips above the high of the right shoulder. This gives me room to cover the spread plus a little cushion for 15 Minute time frame noise. My take profit is twice my risk. 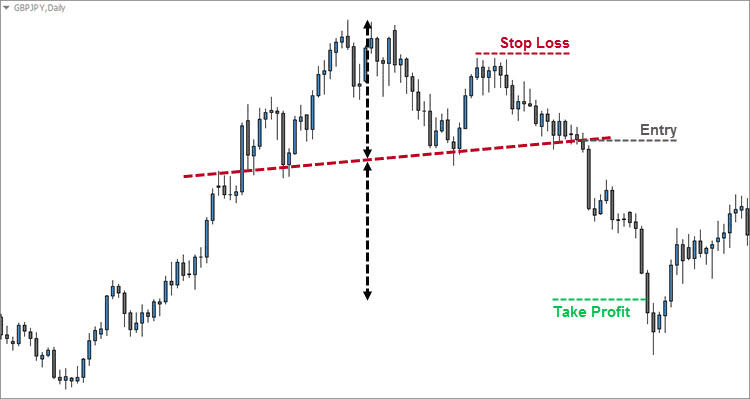 In the example above, you could have easily used the neckline as your take profit level instead. The head and shoulders chart pattern can be tricky to spot at times, especially in the Forex market. However, it’s worth learning to trade properly, because many strong reversals are preceded by this chart pattern. Just like with candlestick signals, the context in which you trade this chart pattern is very important. A true head and shoulders chart pattern only comes after an uptrend. The more extended the uptrend, the more reliable this chart pattern is. There are many ways to trade the head and shoulders signal. I prefer to use a more aggressive approach. I like to enter early, and move my stop loss to break even before the neckline is even given a chance to act as support. That way, if the pattern doesn’t work out, I still have a chance to make money or break even. I hope you can see why I like trading the head and shoulders chart pattern. With the right technique and a little practice, the head and shoulders could become one of your favorite trading setups too. Did you enjoy this article? Let me know in the comments below. Good luck and happy trading! I try the last year to trade binary options, but I’m still in the mood, even if only a small amount. Now I’ve tried to trade Forex based on your techniques, especially the double bottom and the top and the head and shoulders, and finally all I’ve learned starts to fit in and make sense. So far I have been trying only for a week and I’m in a loss, but it’s more of my inexperience. I had a profit of 80-160% several times, but instead of selling, I’m waiting for more profit and I’m waiting. The price goes down and I’m almost at zero. Thanks to your instructions, I can not wait long, but to the next level. As I write, I am a beginner and I will continue to learn, thank you for your lessons and continue on. Do you think I should continue learning, please support me, I will be glad for your reaction. Sorry for my late response, Rene. I hurt my back, so I haven’t been able to work in my office for about a week. I’m glad that you’re finding this website useful. It does take practice and experience. There is a very thin line between losing money and making money in trading. Often it can be a matter of getting one or two more details right. It takes time to be consistently profitable. Don’t give up. Invest time (and money if necessary) in yourself and your trading education and keep plugging away at it. Good luck!